Someday I'll Sleep Autism Blogs: Do Our Children Belong in Church? Me... back before the days of juggling babies at Mass. "Our faith, people, is not about a place, like the synagogue. It’s about a person. Christ. That’s who we go to see on Sundays. Christ literally said, “Let the little children come to me.” He didn’t say, “unless I’m in the synagogue, or in Mass; then, keep them home so they don’t disturb the people who are really trying to focus on Me.” Actually, can you imagine Christ saying that? Saying, “hey, those kids get in the way of other people praying, so keep them home” or “it’s selfish of you to want My graces for yourself when the presence of your children bothers some of your fellow parishioners. Wait till the kids are older until you come see Me again.” If you can, you know a different Christ than the one I know. I think we should take him at his word and let them come to him, in the same place he comes to us: in the Mass." When starting to think about the post I was going to write here and what I wanted to add, I began by looking back over what I've written in the past about taking little ones to Mass. The first thing I noticed was that apparently I write on the topic once a year. Thought #2 was in response to my first post on the subject which was, "Oh look how cute! I used to have a strategy when we went to Mass with one child and I thought it was difficult!" followed by hysterical internal laughter... because that child wasn't even Maggie so I didn't even know what it was like to wrestle a wild and crazy Mae Bae for an hour (or more). The second post I wrote on the subject... well, when I brought it up and saw the picture I knew what it was about and started to get upset and decided rereading it probably wasn't the best idea and that it was better to say a prayer for a few of the rudest people I've ever met in my entire life. Then there's my last post on the subject, which is was written around the time I began to realize how thankful I was that we do opt to struggle through Mass together as a family. The basis of this post, however, will be the question that was asked in the letter that inspired this most recent conversation on the topic: "What do the parents get out of Mass, if anything, when they have to juggle a screamer?" The answer for me, is quite simple: The grace of the sacrament, at the most basic level. But it is far more than that. 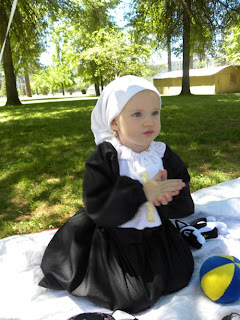 I've written pretty frequently about Sadie's hunger for the Eucharist. I cannot even begin to believe that that passion would exist if she had never been to Mass. I can't imagine that now, at the age of four, the child who won't stop moving, running, jumping, dancing, climbing would be siting next to be silently for 90% of the masses we've gone to, if we hadn't gone before this point and shown her that there are expectations for her behavior. I also think of all the prayers for these children that I've brought into the world that would have been missed if we'd stayed away from our parish. You see, Sadie and Mae were both born when we went to a small country parish back in California. Many Sunday's they were the only children there. People loved to see them. They had a dozen grandma's, who missed their own little ones who were scattered across the country, and their faces would light up when they saw Sadie and Mae. And they prayed and prayed for us. They prayed through my pregnancy. They prayed when the girls were born. And they prayed as our girls grew. 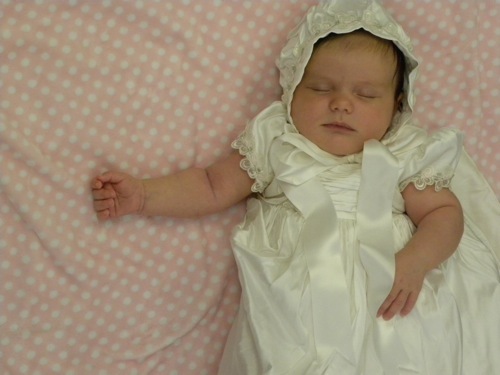 I doubt our family would have been showered by the prayers of our parish if we'd simply disappeared when Sadie was born, because there is some truth to the statement "out of sight out of mind." Is it selfish to want to raise our children surrounded by a community of faith and prayer, exposed early to the beauty of the sacraments? Some, who are rather vocal in certain comment boxes, would say yes, it's horribly selfish. Let me sit here in complete silence and keep your filthy brats at home until they reach the age of reason. You're allowed to do that, you know. I don't think that it is selfish to take a child to Mass. I think that it's a gift on so many levels, that blesses the child, the family, the parish and the Church as a whole. Yes, we should use common sense. Yes, we should remove a screaming child. I've spent many a mass in the narthex, in hallways, in the back, outside heavy doors shivering or sweating or basking in the sweetness of spring and autumn, depending on the weather. I've whispered that this "isn't how we act at Mass and no I'm not putting you down and we'll come right back out here if you try that again, and yes you do know how to act!" plenty of times. But I also believe we should welcome children into our churches with open arms. I no longer have any great game plan when we go to Mass these days. I never know what's going to happen. We have a general strategy. Daddy takes Patrick. I take Mae. Sadie stays between us and stands, sits and kneels when everyone else does. But I don't know what's going to happen. Is Mae going to fall asleep and get an A+ for Mass behavior like she did yesterday? Or is she going to spend Mass being held at the back, with a few trips outside to talk about behavior (thankfully that is happening less and less frequently). Is Patrick going to sleep and smile through Mass? Or will he have a full blown asthma attack and have to be taken outside into the cold? Will Paul or I have an asthma attack? Do I have my inhaler in one pocket? Do I have two junior epi pens in my coat pocket, just in case things go really, really wrong somehow? I try to imagine my life without the sacraments. When people say "stay home until your kids are older" I wonder if the contraceptive mentality of our culture hasn't somehow seeped into their brains. When will our youngest kids be "older." Will it be in five years or twenty? God alone knows the answer. 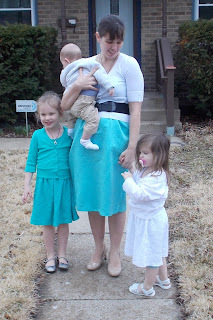 If I'd stayed away from Mass until our kids were "older" I wouldn't have gone in the past four and a half years. Somehow I don't believe that spending a possible 20+ years at home with the nursing baby of the moment would help my family grow in holiness. I don't think that it would give my children their best shot at growing in holiness. I don't believe it would help me fulfill my vocation. And you know what else? I don't think that hearing a child make a sound for a few moments is going to harm anyone, anymore than hearing the smoker's cough of the man who always used to sit next to me, reeking like smoke, even when I changed seats, harmed me back before we had kids. Did it irritate me? You bet. It was even hard to breath. But I tried my best to offer it up because I knew he didn't smell like smoke specifically to irritate me. We live in a world where many believe that children no longer should even be seen out in public places, less they spoil the scene with their clumsy, grubby baby-ness. We don't want children on our planes or in our restaurants. They annoy us in the check out line. It's only natural then, to expect that they not be allowed in our Churches. As Christians we must reject this mentality. We must reject a world that tells us that children should be kept in child designated areas and not allowed out to interfere with our hurried, hectic, adult focused world. Above all we must take Jesus at his word and let the little children come to him. For he is present at the Mass and I have seen firsthand how his presence can affect even the smallest of hearts. When I was single, I attended an EF church almost exclusively. There were a *lot* of kids there, as you might imagine, and kids do make noise from time to time. Honestly, so long as they weren't old enough to know better or the parents weren't doing something stupid, I didn't mind at all. For clarification: when I say "doing something stupid," I mean things like letting a three-year-old bring a toy hammer into church and then being surprised that he hammers on the pew with it (and still not taking it away), or ignoring two siblings having an active, name-calling, screaming fistfight during Mass. Babies cry. Parents know how to deal with babies crying, whether by soothing them on the spot, feeding them, or, when they're inconsolable, walking them out of the church. 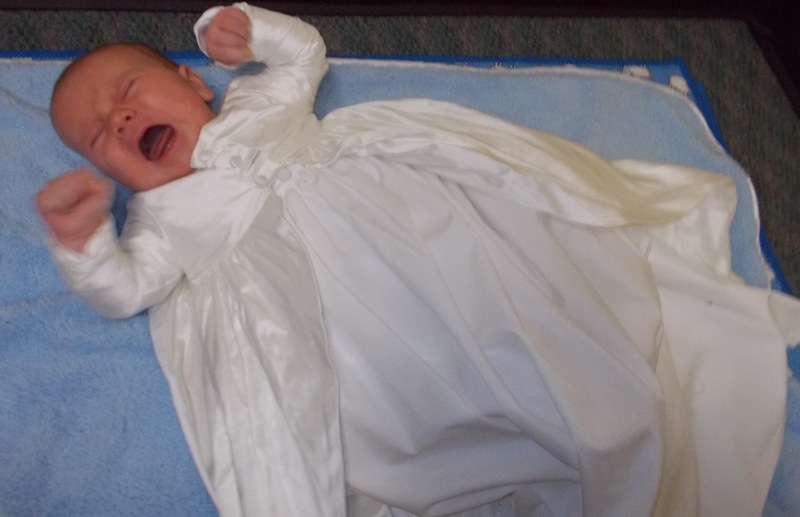 Baby crying is the sound of the church growing, sez I. All of that having been said, there were times when I really needed a quiet Mass at which to collect my thoughts, as I'm easily distracted by noise. At those times, I'd go to a Mass at which I could confidently expect very few kids. I thought Calah did a nice job and I agree with both of you, so I don't have much to say on the subject. I also just don't care if anyone disagrees with me... if they insist on being so easily annoyed, that isn't my fault. The one thing I wondered was why Paul takes Patrick at Mass and you take Mae? I only ask because we do the exact opposite. James takes the squirmy toddler who can easily squirm out of my arms and I take the baby who I can nurse if I need to. It never even occurred to me that some people have a problem with babies or young children at Mass. I mean..what else are those parents to do. Those people obviously never breastfed or lived far from family or had any idea how hard it would be for parents to attend. Furthermore, there is an OBLIGATION to attend Mass every Sunday. Of course there are exceptions for illness or severe weather, etc, but there is no exception for "I have a baby that might cry or a toddler that might scream"
Obviously, if a child is being really loud, they should be taken out, and I think all parents have spent many hours in the narthex or outside the church, and I've never actually heard a parent leave their really screaming child in church. I love this. I only have one baby this far, but I've experienced parishes that are vibrant and full of noisy young families, and parishes that are the opposite. I much prefer the former, and you know what? It just feels holier. I get more out of the Mass somehow when I feel like I'm in a community that values raising young saints- and the kids are better behaved, too, I'm sure in no small part because they don't feel the burden of being resented, but instead are celebrated and cherished. I've always wondered how people think kids are going to want to go to church when they are older if they aren't brought up IN church. It's the same with the pressure to send kids to Sunday School. They are going to find Mass 'boring' if they are used to doing arts and crafts all morning. Cam, I know this is a struggle for many people in the RC. In the Eastern Orthodox Church, which I belong to, there's never a question if your priest is toeing the line of what is truly expected. "Let the little children come to me" Babies have communion, so there's no reason to stay away. I love your blog! It uplifts and teaches me things. Thank you so much!!! Our priest made an statement a few Masses ago making sure everyone knew children were welcome, cry rooms available when necessary, AND that he didn't want the parent/child to remain in the cry room only until the child was calm enough to be in the pew. At the inlaws, we tag team but try to remain present for as much as possible. Kids need to be welcome. This was the second post I read on this topic so I am guessing it was an issue for a number of people this weekend. Messywife.com Was the othet post. Gotcha. Yeah, if it is special Mommy/Mae time, that would be hard for either of you to give up. Your very best (and most beautifully written) posts are the ones in which you are really passionate about something... like this!!! While I certainly expect a parent to remove a screaming child (and most do) I cannot imagine the mentality that doesn't welcome little ones to Mass. Sadly, it reflects the anti-child culture that seems to be growing in some quarters. Children aren't troublesome little entities... they are the future of our Church! My father in law said his parents didn't attend a Mass together until all the kids were old enough to sit through it. So she would go and he'd stay home with the kids and then he would go and she'd be home with the kids. How sad is that?!? The Mass is supposed to bring families together, not divide them! And I can't imagine being more divided than that. When we had a remodel at our parish a few years back our Pastor did away with the larger cry room. The room is now much smaller and has 6 chairs. His motivation was he didn't want families walking in and just sitting in the cry room the whole time. He says on a regular basis that children need to be seen in Church. They can't learn to behave if they are never there. And he encourages families with young children to sit near the front where they can see what's going on. When all they can see are the backs of people in front of them they get bored very quickly and act up! One last thing, on the question of what do parents get out of Mass when they are dealing with a screamer?? Some weeks, just the Eucharist. And if that's the case then that's enough! My mom has reminded me on many an occasion that right now going to Mass is not about me and what I get out of it. Right now going to Mass is about teaching my children and setting a good example. And if we do that eventually the screaming becomes less and we will spend more time in the pews and less in the vestibule. Blessings on your week, Cam! I love this post. My favorite part of the community at Mass is the families with kids. Mostly because I know how much it takes to get kids ready and out the door in the morning, then to try to get them to behave (probably after feeding them breakfast, so they have lots of energy). AMEN!!!! I love going to Mass as a family, and our kids love church like nothing else. We go even on vacation, multiple times during the week, and our kids will ask to go the local Shrine or the Adoration (they are just over 3 1/2). There are rough days, yes, but nothing warms me more than hearing my son (who is autistic) whisper the Eucharistic prayers along with the priest (including kneeling, etc) or my daughter run up to a nun and say "I love you, Sister". It's perfection in my opinion. The only time I had a complaint is when this grandma wouldn't control her two kids during Pentecost. They were running up to the front of the church during mass to play near the giant cross and climb on it. She had some stern words spoken to her after because that is just way out of line. Her children were 5 and 4 and from what I know she's a pushover and doesn't correct behavior. Now that they are in preschool they are doing much better, but I see how unchecked behavior to the extreme can cause disruption. I'll defend the curmudgeons somewhat. There are three main categories, as far as I can see, that can legitimately rustle the jimmies of your fellow parishioners and then predispose them to natiphobia. First we have the noise-makers. They are the ones running matchbox cars along the top of the pew, digging through mommy's purse and finding the hardest or noisiest item they can bang or shake to make noise, or any number of behaviors meanwhile the parents ignore the whole thing. Then there are the snackers. A priest once joked with me that he could end world hunger with the cereal sweepings from the last 5 pews every Sunday. Then there are the scamps. These little ones are scientists. They are out to find what behaviors are egregious enough to finally get the attention of their parents. This can over lap with the noisemakers, but also includes dancing in the pews, flopping kneelers up and down to various effects, or the tried and true 'mommy, mommy, mommy, mommy... ad infinitem'. These are not to be mistaken for the energetic youngsters that parents try to control, to varying success. Nor are they equivalent to the occasional shout, squeak, or even nuclear-meltdown-that-necessitates-leaving-mass-for-the-auditory-health-of-others. So the cranky natiphobe may have had to sit through little Jimmy keying the pew in front of them, or Susie loudly and methodically tearing the bulletin to shreds and handing the scraps to mama or papa, and now has bunched your little one(s) into that same group. Unfair - true, but be patient. For some people, myself included, the Mass is a reprieve from the rest of this maddening world. It can be stressing to have to share that with a young child's playtime. As our pastor always says, a "starter family" in our parish is one with only 5 kids. At a typical Sunday mass, at least half the attendees are under 20 --- and sometimes I look around and think it's under 10. That said, our large church does echo with each baby cry --- but I am surprised at how few of them there are. And among the talking young, there are few screams and ALL have been taught how to whisper --- something noticeably absent in other parishes I've been to. And even the youngest, like Cam's girls, have a respect for the Eucharist. All go up to be blessed if too young to receive, and almost all use hymnals to sing or follow the readings. Maybe all the kids are on drugs (just kidding), or maybe the parents (and the special children's liturgy of the Word they have to explain the readings) help them to understand what it all means. I do remember when my daughter was an infant that this older lady came up to me and told me that I needed to give my children "some of the sacramental wine to keep them quiet." I told her that my children were permitted to "make their joyful noise to the Lord however they pleased." We never heard from her again. Also, before my son was diagnosed on the Autism Spectrum, I spent many a Mass on the narthex floor crying and frustrated due to what I thought was my inability to control my children. I had one nice woman come up to me and reassure me that it would get better. What a difference in these two women at two different churches! The discussion has gotten ugly. I hope you don't mind that I linked this article. I figured it's only fair to let you know that I did. A "starter family?" Wow. How hurt and offended would I be if my pastor said that? After my fourth cesarean section, my OB gently told me that I had a good-sized window in my uterus and that future bio kids were totally out of the question. I guess my family wouldn't even qualify as "starter" according to that priest - even though at our Catholic school I am tied with one other family for having the most children, out of 130 Catholic families! What perspective some people have. And what sensitivity! Sheesh. When will Catholics stop judging each other by the size of their families? On the topic of bringing kids to Mass - my second was born with breathing problems in December of 2006. Our pediatrician said he could not go to public places and had to be kept as isolated as possible for six months. I missed three weeks of Mass postpartum, and that was it. It's not a choice of "miss Mass or take the kids." My husband and I simply switched off - I'd go at 8 AM, and he'd go at 9:30. Kids stayed home. No big deal. When flu and RSV season passed, and our son was older, we would either go as a family, or we'd do the switching thing. Now that my kids are 8, 6, 3 and 1 - we do it both ways, together or trading off if we need to really focus that Sunday. Sometimes it's the only break I get all week. 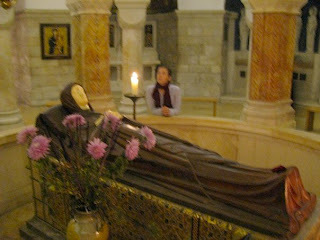 Sometimes I just need that quiet and unencumbered time to pray and reflect. Neither my husband nor I miss Mass. And, when our youngest is 3 or so, we'll usually go together as a family. None of my kids have had trouble adapting to Mass, because once they are four or so, you just tell them there's no messing around. My kids know what the Eucharist is, and are excited for 2nd grade (my oldest made hers this year!) to come around so that they can receive. It's all good, whatever a way a family works it out. Nothing wrong with taking the kids, and nothing wrong with scheduling things so that the little ones stay home. I have no judgment for parents who bring the kids, and none for parents who decide to postpone it after discerning that it's best for the family. Our son does LOVE the echo in our church. We go to a more contemporary Mass so the YEAH and WOW are usually a bit more appropriate than in other venues. My inlaws church doesn't have a lot of little children but both my husband and I had a lot of sympathetic looks when our son was feeling under the weather and inconsolable during Mass this weekend. As far as remarks from much older (elderly) churchgoers go, they are likely reacting as people who grew up in a time when children were SEEN and not HEARD. I remember hearing stories from my grandparents about how their parents threatened them with a switch if they didn't sit silently and hold still during services. Fussing from babies and very small children was understood but that was it. By comparison, the issues that a previous poster mentioned (children deliberately making noise, playing with toys that are not appropriate to the ceremony, etc) would be seen as completely inappropriate to one of my grandparents' generation (or even our own). To reference an earlier post of yours about how children were not allowed in some restaurants...the rule I always used was that if there was no children's menu, then children really didn't belong there (and yes, I have seen parents take young children into restaurants of this nature and it was glaringly obvious they had not taught their children how to behave in fancy restaurants). Beyond that--kids' menu? High chairs/booster seats? Bring them along! I think the Mass behavior can definitely help with the restaurant behavior (random, semi-related thought) because I think it's made it way easier for our children when we eat out to know how to behave since they're regularly expected to be quite and sit still and that makes restaurant eating a piece of cake. But then again, I'm not really a fancy restaurant type of person, and tend to prefer family restaurants, so it's pretty much a non-issue with us (although I still think it's totally weird that the law could be forcing "those" restaurants to allow dogs here. I've only seen really bad older kids twice. I know this may be because we tend to be around more traditional communities, but the only toys we see here are occasional religious books. I've heard the horror stories, so I know it goes on, but I've never actually seen the cars and toys of that sort (oh my goodness, once Mae smuggled a ball into Mass and I almost died...thankfully Paul grabbed it and took it out to the car). I do let Mae take a little doll that she holds in her hand now and then, and in the past Sadie's bought her nun doll, but I do wonder how much toys are the norm (if anyone wants to comment on that). I have a feeling they are more the norm other places... and that would make life way more difficult for parents like us with a you sit-stand-kneel-and-never-snack policy.